One of the largest coral reefs in the world, the Mesoamerican Barrier Reef System, also known as the Mesoamerican Reef or Great Mayan Reef, extends more than 600 miles from Isla Contoy at the northern tip of Mexico's Yucatan Peninsula to the Bay Islands in Honduras. The reef system includes various protected areas and parks, including the Arrecifes de Cozumel National Park, Sian Ka'an Biosphere Reserve, Arrecifes de Xcalak National Park, and the Cayos Cochinos Marine Park. Surpassed only by the Great Barrier Reef in Australia, the Mesoamerican Barrier Reef is the second largest barrier reef in the world and the largest coral reef in the Western Hemisphere. A barrier reef is a reef that is in close proximity and extends parallel to a shoreline, with a deep lagoon between it and the shore. The Mesoamerican Reef contains more than 66 species of stony corals and more than 500 species of fish, as well as several species of sea turtles, manatees, dolphins, and whale sharks. The location of the Mesoamerican Barrier Reef—just off the coast from Cancun, the Riviera Maya, and the Costa Maya—make these prime destinations for those interested in scuba diving and snorkeling on their vacation. Some great dive spots include the Manchones Reef, Cancun's Underwater Museum, and the ​C58 Shipwreck. Just make sure to brush up on scuba diving before heading to the Yucatan Peninsula. 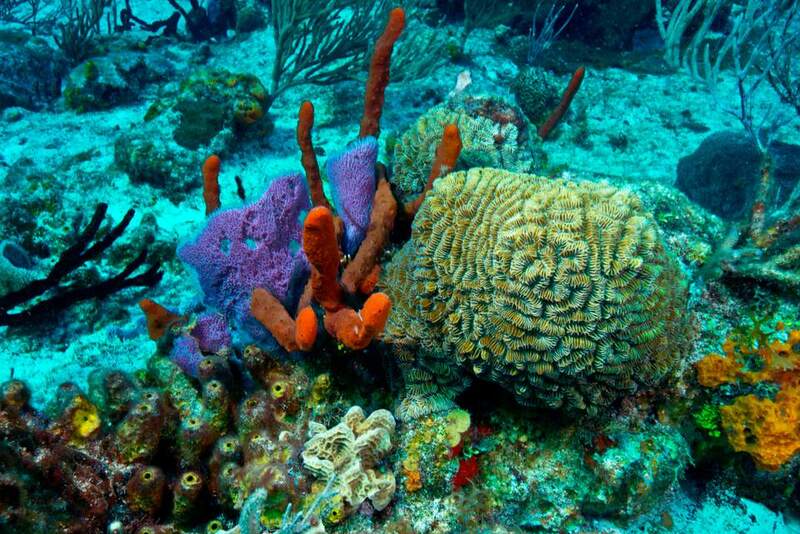 The coral reef is just one component of an ecosystem that includes mangrove forests, lagoons, and coastal wetlands. Each of these elements is important for the preservation of the whole. The mangrove forests function as a buffer and help to keep pollution from the land from reaching the ocean. It also acts as a nursery for the fish of the coral reef and feeding and foraging grounds for diverse marine species. This ecosystem faces many threats, some, like tropical storms, are natural, and some are caused by human activity such as over-fishing and pollution. Unfortunately, coastal development often comes at the expense of the mangrove forests that are vital to the reef's health. A few hotels and resorts are bucking this trend and have made an effort to maintain the mangroves and the rest of the local ecosystem. One of the efforts to protect the Mesoamerican Barrier Reef is the construction of an artificial reef. This huge environmental project was undertaken in 2014. Around 800 hollow pyramidal structures made of cement and micro silica were placed on the ocean floor near Puerto Morelos. It is believed that the artificial reef helps to protect the coastline from erosion.The structures are designed to be environmentally-friendly and encourage the formation of new natural reefs and regenerating the ecosystem. The project is called Kan Kanán and is hailed as "The Guardian of the Caribbean". At 1.9 km, it is the longest artificial reef in the world. Seen from above, the artificial reef is laid out in the shape of a serpent.